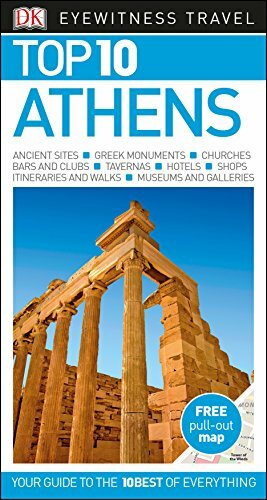 An unbeatable, pocket-sized guide to Athens, packed with insider tips and ideas, colour maps, top 10 lists, and a laminated pull-out map - all designed to help you see the very best of Athens. Discover ancient treasures at the National Archeological Museum, visit the Acropolis's breathtaking temples, wander Filopappos Hill's pine-covered slopes, or marvel at the Temple of Olympian Zeus. From the Top 10 archaeological sites to the Top 10 city strolls - discover the best of Athens with this easy-to-use travel guide. Inside Top 10 Athens: - Ten easy-to-follow itineraries, perfect for a day trip, a weekend or a four-day trip - Top 10 lists showcase Athens' best attractions, covering the Agora, the Roman Forum and Tower of the Winds, the Museum of Cycladic Art and many more - Free laminated pull-out map of Athens, plus eight colour neighbourhood maps - In-depth neighbourhood guides explore Athens' most interesting areas, with the best places for shopping, going out and sightseeing - Colour-coded chapters divided by area make it easy to find information quickly and plan your day - Essential travel tips including our expert choices of where to stay, eat, shop and sightsee, plus useful transport, visa and health information - Colour maps help you navigate with ease - Covers Plaka, Monastiraki, Ominia, Syntagma, Piraeus, Delphi, the Peloponnese and more Staying for longer as part of a bigger trip around Greece? Try our DK Eyewitness Travel Guide Greece, Athens and the Mainland. About DK Eyewitness Travel: DK's Top 10 guides take the work out of planning a short trip, with easy-to-read maps, tips and tours to inform and enrich your weekend trip or cultural break. DK is the world's leading illustrated reference publisher, producing beautifully designed books for adults and children in over 120 countries.